Detention Center Camp 6, which can house as many as 175 people, now holds 26 in Guantanamo Bay, Cuba. President Trump has promised to send more war captives to Guantanamo Bay. Navy Capt. John Filostrat, Guantanamo detention camps spokesman, provided a guided tour of the facilities in their current state. Camp X-ray, where first captives were held, is now abandoned. If President Trump wants to keep his promise to send new detainees to the detention center at Guantanamo Bay, there's plenty of room. "We haven't received any orders to take additional detainees in," says Navy Capt. John Filostrat. "But if given the order, we could go ahead and comply." 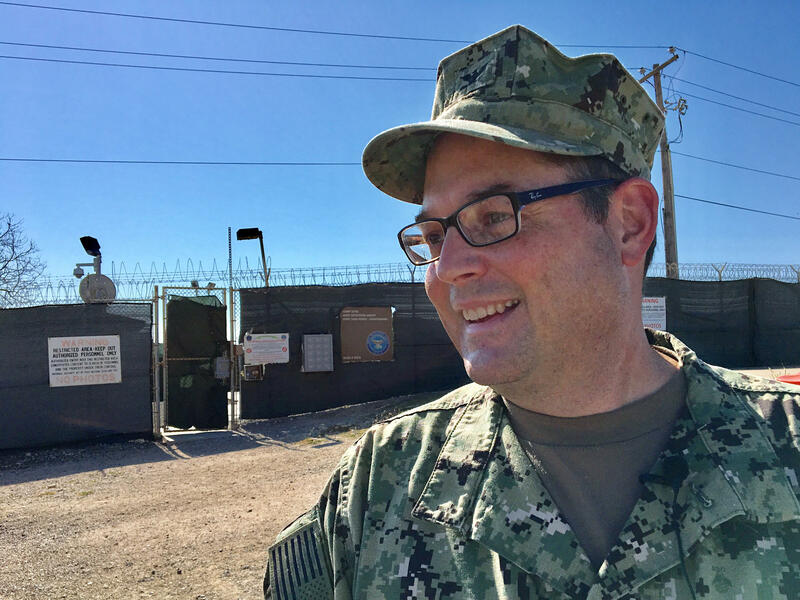 Filostrat, a spokesman for the island lockup, took reporters on their first tour of Guantanamo's prison camps since Donald Trump became president. It was a "windshield tour," meaning journalists could only view the camps from outside the high, razor-wire topped and fabric-draped fences that surround them. Still, this was a rare opportunity to see how things looked around the same prison that President Obama during his last months in office had raced — unsuccessfully — to empty. Trump wants the opposite. He warned during the presidential campaign that the U.S. is threatened by a lot of "bad dudes" whom he'd send to Guantanamo if they were captured. And since his election, his administration has circulated a draft order that could pave the way for a new generation of inmates. The first thing that strikes you about Guantanamo's officially designated "Detention Center" is how provisional the place still looks 15 years after the first captives were brought there. Metal shipping containers and tents are the only housing for a rotating guard force that, despite the dwindled prison population, still numbers around 1,100 — about 27 guards per current inmate. "This was an expeditionary mission," Filostrat says. "Expeditionary means overseas, so it's a temporary overseas Joint Task Force that's been going on for 15 years — that's the conundrum." The dilapidated state of things reflects conflicting policies. Both Presidents George W. Bush and Obama sought to shut down Guantanamo's prisons. Congress, bowing to constituents who opposed any transfers of Guantanamo inmates to the U.S., passed laws making it all but impossible to do that. But far from winding down, Guantanamo's prison complex these days is gearing up. Construction projects suggests its "expeditionary" era is ending and the notorious prison complex may be there to stay. A new permanent dining facility for troops is being built to replace a ramshackle improvised chow hall. Part of Camp 5 — a lockup with isolation cells for "noncompliant" captives — is being converted to a hospital wing. Cement mixers ply the roadways. Another thing that jumps out is the stark contrast between the sprawling scale of Guantanamo's prison camps, the staff who runs them and the relative handful of prisoners. Camp 6, which can house as many as 175 people, now holds 26. Five of them were deemed eligible for transfer to another country by an Obama-era parole-type board, but Trump has made clear he wants no more prisoners leaving Guantanamo. Camp 5, next door, is empty — but it could hold roughly 80 prisoners. So even though Guantanamo received its last new captive in March 2008, today it could accommodate about 200 more. U.S. government officials did not give a precise number of vacancies, and some people stuck in Guantanamo's limbo do not believe Trump should try to fill them. "I think it's an awful, awful idea," says Colleen Kelly. Her brother, William Kelly Jr., died at the Windows of the World restaurant at the World Trade Center on Sept. 11, 2001. For nearly five years, she has watched a newly constituted military commission so mired in pretrial wrangling that it has so far failed to bring to trial five Guantanamo prisoners accused of plotting the attacks. If the U.S. does capture terrorism suspects under Trump, it should charge, hold and try them in the United States, Kelly said. "We have a system of justice in this country that has been tried and tested," she says. "For more than 250 years, it has served us well. And the military commission, as much as there is an earnest effort by the prosecution, it's all untested — and to have that continue on and on, it's an awful idea." The military commissions have led to only eight convictions. Three of those rulings have been overturned entirely; three more, partially. Ten Guantanamo inmates are at some stage of a military commission proceeding. Seven of them have yet to see their cases even come to trial. All 10 of those who stand charged before a military commission are being held, along with five others, at a secret site known as Camp 7 — not part of the windshield tour. Spokesman Filostrat says journalists are not allowed to view Camp 7, even from the outside. "It's classified," he says. "I can't even tell you where it is. I've never been there myself." All of Camp 7's occupants have been designated "high value detainees." They share another dubious distinction: According to a synopsis of a Senate study of the CIA's Rendition, Detention and Interrogation program, all were previously held and harshly interrogated at "black sites," CIA-run clandestine prisons in various countries worldwide. As a result, while five men in Guantanamo are facing trial and possible death penalties for plotting mass murder, the U.S. government is now being pushed by the defense to provide classified evidence that those men were subjected to interrogation methods widely seen as torture. In short, as the government is prosecuting the defendants, the defendants are prosecuting the government. "What this case has demonstrated, if it's demonstrated anything, is that torture makes criminal cases virtually impossible to prosecute," says James Connell, attorney for Sept. 11 defendant Ramzi bin al-Shibh. "In fact, it's fair to say that torture and due process are mutually exclusive." The case of the accused Sept. 11 plotters has paradoxically become the biggest criminal proceeding in American history and one of the most obscure and slow-moving. "When cases involve torture, they are also going to be festooned with a lot of secrecy, in order to protect the people who engaged in the torture," says David Nevin, lead lawyer for accused Sept. 11 mastermind Khalid Sheikh Mohammed. "That slows down discovery, it slows down investigation, it slows down the nature of the trial and the hearings and everything — it slows everything way down." Other relatives of Sept. 11 victims are, like Kelly, frustrated with the slow pace of justice, but they stand by the military commissions process, which has been revised three times. "They need to take as long and be as painstakingly thorough as possible," says Marvina Baksh, whose brother Michael Baksh died in the airliner attacks on the World Trade Center. "I guess that's just something we have to, in this instance, wait for the fruit to ripen and then it'll be all good." Baksh was speaking at a news conference in Guantanamo after watching, as a guest of the prosecution, the war court meet for just three hours in a session that had been scheduled to last two weeks. "Please know that justice will be done in the end," Brigadier Gen. Mark Martins, the chief prosecutor, assured Baksh and four other victims' family members. "And until then, we will not rest." Trump's draft executive order on Guantanamo calls for "swift and just trial and punishment" of the accused. That has not been the chief prosecutor's experience. "I believe that we're going as fast as the statute, and the procedures we have, enabled it to go," Martins says. Asked whether Trump wants him to remain as Guantanamo's chief prosecutor, Martins is laconic. "I'm here indefinitely," he says. Just 41 prisoners remain at the U.S. Naval base in Guantanamo Bay, Cuba, but the U.S. may soon send a new generation of inmates to Guantanamo. That's what President Trump promised to do in the campaign. And it's part of the administration's plans, according to a draft executive order made public late last month. NPR's David Welna reports from Guantanamo. 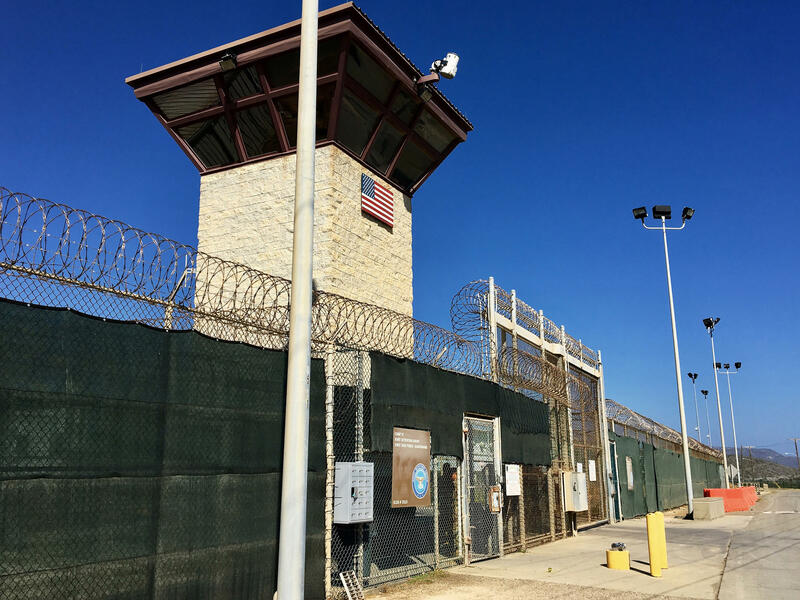 DAVID WELNA, BYLINE: Please join me and a few other reporters on a guided tour of Guantanamo's prison camps. It's what's known as the windshield tour. You can look at the camps, but only from the roads outside. JOHN FILOSTRAT: How you doing? Hello, everyone. WELNA: Our guide has just climbed into the crowded tour van. FILOSTRAT: Captain John Filostrat, U.S. Navy. I'm the public affairs officer for the Joint Task Force. Let's just do a quick spin around, and then we'll stop in front of Camp Six. 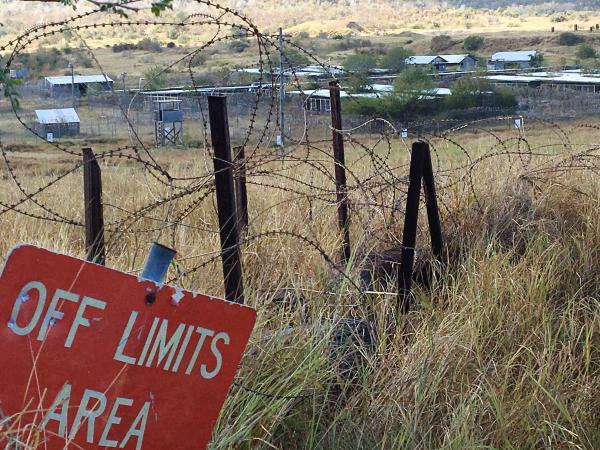 WELNA: We head down an asphalt road past tan tents and cargo containers, makeshift housing for the 1,100 troops who guard Guantanamo's 41 prisoners. Captain Filostrat says a lot's changed here over the past few years. FILOSTRAT: The biggest difference is obviously the number of detainees, also the behavior of the detainees. When I got here in 2013, there were protests going on inside the camps. Definitely a different time. WELNA: So there are not protests now? FILOSTRAT: No. They're highly compliant. WELNA: That may have to do with a guard-to-prisoner ratio of about 27-to-1. Those inmates, as our guide points out, occupy two very distinct camps. FILOSTRAT: There's Camp Six and there's Camp Seven. And those are the two facilities that house the 41 detainees that are currently here at Joint Task Force. WELNA: What's the difference between Six and Seven? FILOSTRAT: Camp Six is a, you know, modern-day facility that houses the general population detainees. Camp Seven is a secret facility that houses high-value detainees. WELNA: Can we see it? WELNA: And why is that? FILOSTRAT: It's classified. I can't even tell you where it is. I've never been there myself. WELNA: All 15 men in the secret Camp Seven have at least one thing in common - all were previously held in other countries in secret CIA prisons known as black sites. According to a Senate report, all were subjected during that time to brutal interrogations. Our van's now pulled up to a big area surrounded by high covered fences bristling with rolls of razor wire. FILOSTRAT: So up here on the left is Camp Six and Five. WELNA: There are currently just 26 prisoners being held in these camps. Filostrat says there is room for at least 200 more. FILOSTRAT: We haven't received any orders to take additional detainees in, but if given the order we could go ahead and comply. COLLEEN KELLY: I think it's an awful, awful idea. WELNA: That's Colleen Kelly. Her brother Bill perished in the World Trade Center on 9/11. For the past five years, Kelly's been watching a military commission in Guantanamo struggle to bring five occupants of Camp Seven accused of plotting the 9/11 attacks to trial. She says sending even more captives to the dysfunctional war court makes no sense. KELLY: As someone who has waited five years for even the glimpse of a trial that hasn't happened, why would we do that? We have a system of justice in this country that has been tried and tested. For more than 250 years, it has served us well. And the military commission, as much as there is an earnest effort by the prosecution, it's all untested. And to have that continue on and on, it's an awful idea. WELNA: Other relatives of 9/11 victims stand by the military commissions. Marvina Baksh also lost her brother on 9/11. As a guest of the prosecution, she talked to reporters after the latest attempt to hold a two-week hearing here collapsed on its first day. MARVINA BAKSH: They need to take as long and be as painstakingly thorough as possible. And I guess that's just something we have to, in this instance, wait for the fruit to ripen. Then it'll be all good. WELNA: Baksh was assured by the chief prosecutor, General Mark Martins, that her patience will pay off. MARK MARTINS: Please know that justice will be done in the end. And until then, we will not rest. WELNA: But David Nevin, who represents accused 9/11 mastermind Khalid Sheikh Mohammed, says torture will keep complicating the prosecution's quest to prove his client guilty and have him executed. DAVID NEVIN: When cases involve torture, they are going to also be festooned with a lot of secrecy in order to protect the people who engaged in the torture. And that slows down discovery, it slows down investigation, it slows down the nature of the trial and the hearings and everything. It slows everything way down. WELNA: Indeed, the recently leaked draft executive order for Guantanamo has been tweaked and no longer seeks to revive harsh interrogations. But it still recommends repopulating Guantanamo, halting prisoner transfers to other countries and finding a way for military commissions to deliver what it calls swift and just trial and punishment. David Welna, NPR News, Guantanamo Bay, Cuba. (SOUNDBITE OF OREGON SONG, "1000 KILOMETERS") Transcript provided by NPR, Copyright NPR.